On May 11th., the opening ceremony of The 3rd Silk Road International Expo was held in Xi’an, the starting point of the Silk Road. The expo is co-hosted by National Development and Reform Commission (NDRC), Ministry of Commerce, All-China Federation of Returned Overseas Chinese, All-China Federation of Industry and Commerce, China Council for the Promotion of International Trade（CCPIT）, the State Administration of Industry and Commerce (SAIC) and Shaanxi Provincial People’s Government. The Expo is to be held from May 11th to 15th. The theme of this expo is “New Era, New Pattern and New Development”. 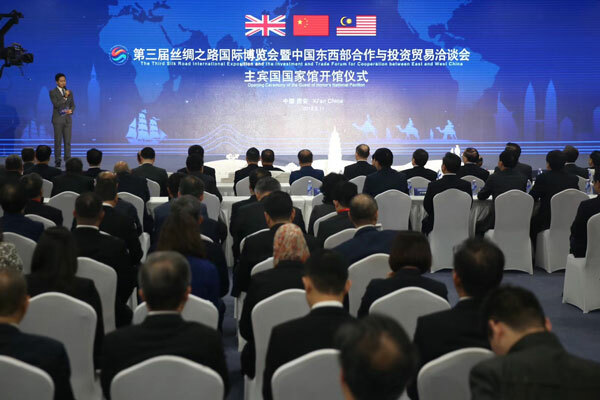 The guests of honor are the United Kingdom, Malaysia, Guizhou Government, Tianjin Government and Yan’an Government. In addition to the routine forums and meetings, 16 important conferences and 6 investment and trade promotion events are to be held on the Expo.